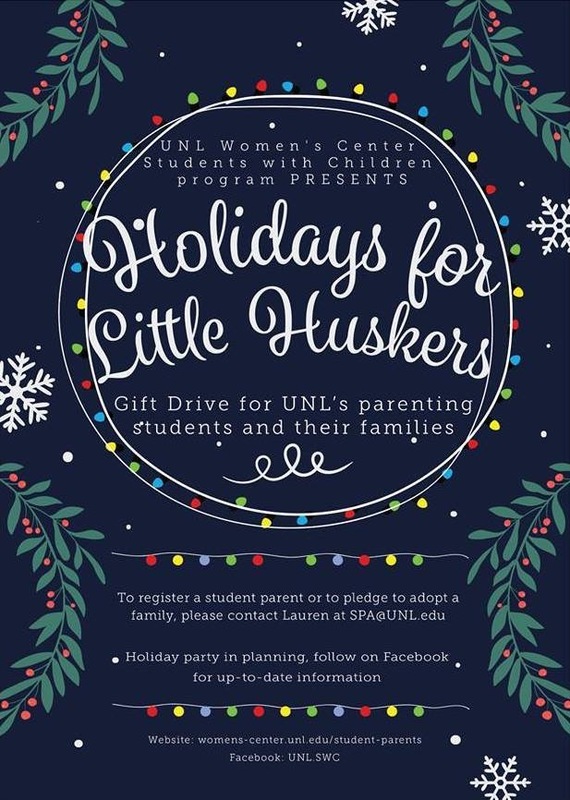 This holiday season UNL's Women's Center Students with Children program will be hosting a non-denominational holiday gift drive for student parents and their children. Donations will assist hard-working students who make sacrifices in order to provide a better future for their children. Many student parents support themselves and their family through the financial aid and loans they receive, along with the hours they work when not in class or with their children. It is our hope that this drive will be the first of many, and ease the burden Student Parents may feel this time of year. The mission of Students with Children is to advocate for the needs of student parents on campus. Additionally, we reach out to students with children and listen to their concerns and needs regarding support and resources vital to their success at UNL. We aim to provide an inclusive and reliable community for Student Parents by providing child friendly events, assistance, and resources.